Tata Motors, India’s largest commercial vehicles manufacturer and among the Top 10 globally, today showcased the country’s first LNG (liquefied natural gas) powered bus in Kerala, in the presence of Hon’ble Minister of MoPNG (Ministry of Petroleum and Natural Gas) Shri Dharmendra Pradhan and Hon’ble Chief Minister of Kerala Shri Pinarayi Vijayan. With India expected to see an increase in demand for LNG over the coming years, owing to increased demand from the power, fertilizer and automotive sectors, the government plans to move towards a gas-based economy, with Kerala as the first state to explore trial run of LNG-driven technology. We at Tata Motors are proud to showcase the country’s first LNG bus; our gas-fueled people mover. As one of the country’s largest bus manufacturers, the Tata LNG bus is based on the Tata Motors understanding of the various transport authorities for public transport, creating a win-win situation for all stakeholders – for clean, safe, affordable and comfortable commuting. With LNG, we are not only FUTUREADY, but are extending that capability towards the energy security of our nation. Tata Motors has pioneered the introduction of Natural gas vehicles (CNG) in the country, with a large fleet of buses running in various parts of the country. 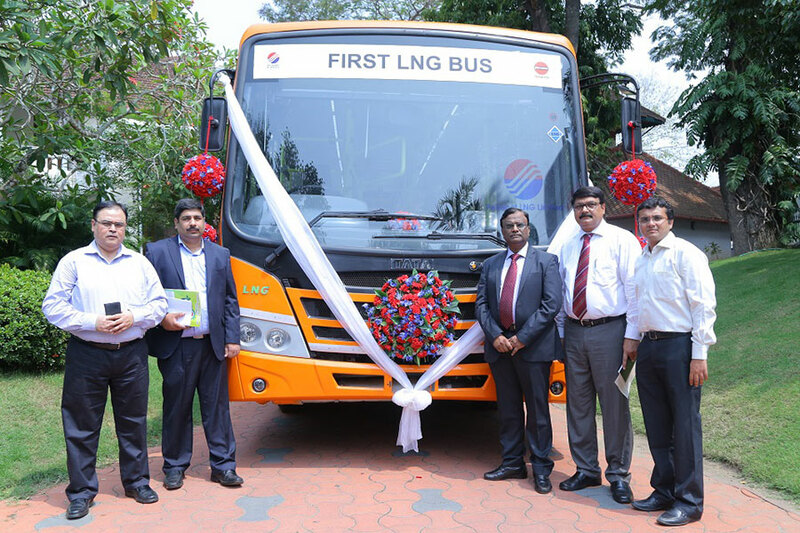 Tata Motors LNG powered Tata LPO1613 bus, is lighter in weight compared to buses powered by conventional fuels, and has enhanced levels of payload. Moving towards gas power, will not only contribute majorly towards decreasing emissions for a cleaner environment, but will also ensure better fuel efficiency, due to high energy density of LNG, providing for a longer range at more than 700km in one filling. LPG powered vehicles also ensure better Noise Vibration Harshness (NVH) characteristics for passenger comfort. With growing availability of LNG at a cheaper cost, as compared to HSD (High Speed Diesel), LNG also lowers the operating cost of vehicles, further enhancing the efficiency of operators. High energy density and liquid form allows LNG to be stored in smaller size cylinders with a packaging that’s similar to diesel fuel. LNG is also a cleaner fuel and reduces greenhouse gas emissions by 30% with respect to conventional liquid fuels. LNG system operates at lower pressure and also evaporates quickly, given that it is lighter than air and hence evaporates extremely quickly under atmospheric pressure and temperature, hence safer. LNG will also help reduce the dependence on expensive crude oil. Tata Motors first showcased LNG technology on the Tata PRIMA Truck, at Auto Expo 2014 in New Delhi.